Ernst Tanner got his man. 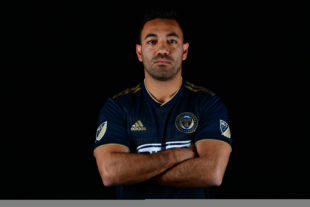 The Union made their biggest splash of the offseason on Friday afternoon, announcing the signing of 29-year-old Mexican international Marco Fabian from Eintracht Frankfurt. “Marco is a high caliber No. 10, a true professional, and we believe he is a good fit for our system,” Tanner said in a press release announcing the deal. The deal is structured as what Tanner called a “one-plus-plus,” meaning a one-year contract with club options for a second and third year. Tanner confirmed that Fabian’s salary would be a club record, topping Borek Dockal’s $1.7 million salary last season. The Union did not pay a transfer fee, and Fabian joins the club as a designated player. From Chivas, Fabian moved to the Bundesliga in 2015. After a strong first season with Frankfurt, Fabian developed a severe back injury that ultimately required surgery in summer 2017. Though Fabian recovered in time to make Mexico’s squad for the 2018 FIFA World Cup, he could not reclaim his place at Frankfurt, making just two appearances so far this season and being linked to moves to Turkey, China, and the United Arab Emirates. The midfielder has made 42 appearances for Mexico’s senior national team. The Union’s roster now stands at 26 players, with Fabian joining Sergio Santos, Kai Wagner, Aurelien Collin, Carlos Miguel Coronel, and Matt Freese as the club’s offseason signings. Tanner said that he does not anticipate the Union making any additional signings before the season starts. Fabian will now join the Union for the second stage of their preseason in Clearwater, Fla. Manager Jim Curtin called Fabian “an elite international,” and that he’s looking forward to working with the talented attacker. “I think it’s the most ambitious signing we’ve ever had,” said Curtin. Peter, I’m impressed… you had the scoop at 4:25 a.m.?! 😉 Just joking with you… Thanks for update! Good news for the Union and their fans. Curious to learn the terms of the deal. YES, now we just have to hope it’s more than just one season so we do not have to see our best player leave again. See fourth paragraph above which is the update. I just hope he stays healthy. Quite risky move after his back problems. Finally!!! Way to go Ernst Tanner! Welcome Marco Fabian! I love that he wrote an open letter to Union fans thanking us for welcoming him and promising to with hard. A nice, classy touch. Who needs a world renowned creative national team central attacking midfielder. This #10 role. Yawn. Jawn. See you on the lawn. But El P! You forget the most important aspect of this deal! It means Brenden Aaronson can play a lot of games as the apex of the central midfield triangle for Bethlehem and grow in an environment less likely to overwhelm him. That in turn means Selmir Miscic can grow at his own pace rather than be forced into USLC as a 16-year-old. The move gives the younger guys a growth opportunity more appropriate to learning and success. If it also happens to get the Union a home playoff game, that’s gravy! While I think the ‘phant might be waxing a bit scarcastic (…or not), my concern is exactly the opposite of your OSC. I see two young players who ought the be getting meaningful, challenging minutes at a higher level. I fear a real possibility for the kind of slow stagnation young US players go to Europe to avoid. Maybe it’ll be different with our guys, but the US approach of seasoning kids until they’re 20-22 hasn’t produced even a trickle of winning world class talent. Like Trusty and McKenzie, I was hoping to see a lot of Aaronson and maybe a bit more Fontana this season. I’ll be as happy as anyone if the team can get a couple of rounds deep in the playoffs this fall with Fabian leading the way, but I’ll withhold my enthusiasm for a 29 year old who just lost a year to back issues and couldn’t get his job back until makes me forget those kids. …Real and Brendan and Derrick… what of you going forward. Guess we’ll see what happens. All I know is if a Union player is getting meaningful International play in World Cups and is showing well, it is a catalyst for potential sale abroad and it will be interesting to see how, Union Pipeline manages its assets. I’m for youth players on the field. I’m more for youth players signing contracts over seas as THAT is the real harbinger of how effective this academy is. The structure of the deal is pretty Union friendly. Doesn’t appear to be Kevin Kratz 2.0. No fee and token 5% sell on. Looks like someone at the Union had fun: the url to the new signing Is Marco “Ph”abian… go Philly! So EXCITED for this pick-up! It is great they got an accomplished International DP (who’s not too old) for #10! That said I am very curious about how the U will line up. Assuming the diamond midfield that we have seen and Tanner says he likes, and assuming that Medunjanin is the wrong guy to screen for a back four whose combined ages equal less than 80, I guess Bedoya plays the bottom of the diamond. Medunjanin looks to be odd man out. But if that is the case, we should have a really exciting front 5 with Burke and Fafa up top, and Santos, Fabian and Ilson as the top 3 of the midfield diamond. Or maybe Santos and Fafa flip. Either way this is the most offensive firepower we have ever seen on a Union team. Looking forward to seeing it work! Without getting into a debate about who exactly will be in the starting XI, the consensus speculation based on Tanner’s own words is that Union will have a narrow diamond (two “8’s”) that helps shield Medunjanin. The width in the attack is provided by the outside back on the side that is attacking at that moment. This is a bad analogy, but it is a little like how an American football defensive front 7 must transform when moving from a 3-4 to a 4-3 or vice versa. Not everyone will fit the demands of the new, different roles. Bedoya is definitely one of the side-points in that diamond, not the base. He’s not a #6. The former role, on the right side, should actually be perfect for him. Oh, and I agree about Haris being on the bench. But the guy who should start at the back point of the diamond is Derrick Jones. I would suspect that Jones will play the bottom of the diamond, Bedoya on the right, Marco up top, and Medunjanin on the left side. I’d guess they’ll play it narrow and the outside backs will bomb up the wings. Clearly Fabian is going to be the top of the diamond. Bedoya and has lined up at right and Medunjanin at bottom all preseason, I doubt that changes. The left is going to be a battle between Creavalle, Jones, and Fontana. None of our forwards (Sapong, Fafa, Accam) are lining up in the midfield. This will easily be the most interesting season, seeing how this does or doesn’t come together. As an organizational effectiveness consult, I’ve been liking a lot of what I’ve seen since the Sak turnover, but this particular interview tells me they are in a really good place now. One of the primary things I see any organization struggle with is “focus”. There may need to be some course adjustments in the future (which is normal), but an organization with a clearly stated plan can identify and make adjustments very qucikly and effectively. This is a 180 difference from where they were 5-6 years ago. Cool article, thanks for sharing, David. Congrats to the Union and Marco. I hope this proves a Chris Pontius revival for him. Union have tried before with Charlie Davies and Jay Simpson and while no meaningful games in two years is a bit risky, I hope it works. To be honest, more excited by the signings of Collin and Kai Wagner. I think those two signings hold more for our future beyond this season. As far as the Fabian signing, and the comment about McKenzie not playing in U20 WC, that shows a commitment to winning more THIS season. While McKenzie is that essential for us to win is arguable, as is notion his value and growth is hurt by not playing the U20 WC, the very message from Union is strong and resounding–we want to WIN! KR gone but Curtin stays–inevitable, couldn’t have both. New coach might have changed things up but looks like Tanner is doing that with formation. Speaking of formation—thank God the single striker formation gone. Said many times Sapong undervalued because he is outnumbered in the box consistently. His 2017 season was magic. Hope we see a return to that form this season with him and Santos, Burke, and Kacper and maybe even FaFa. Defense–want to see more of Elliott and Collin tandem tag team with McKenzie and Trusty, as the latter two continue to mature. Bedoya–think he has chance to shine in the new formation…eager to see more Fontana and Aaronson, especially as I think we will be more conservative with Fabian’s time given his recovery and fitness level still in play. Unlike the rest of you I “Union’s greatest signing” as more hyperbole; a high risk, with above-average potential, and ultimately short-term option. For our club to finally open its wallet, spending more than ever, on a player who hasn’t played in two years just seems odd to me. Where I will say he lives up to the hype if he hopefully provides that sorely needed lockeroom spark of morale and leadership. My biggest concern beyond coach (and team) learning to adjust during the game, is that Curtin fails to take advantage of this depth and instead runs the players into the ground as he does every year. MLS has several weeks of 3 games in 8 days, and Tanner may regret saying “26 is enough”. You’re more excited about Collin than Fabian? I hope Collin plays a grand total of 0 minutes this year. I’m for zero MLS minutes, but he can play all the Open Cup time Curtin wants. Where to start…Fabian has played matches in the past two years. He played 7 in 17′-18, and has played one match this year. Also I hope Fabian produces goals and assists and could care less about “sorely needed locker room spark of morale and leadership”. Why you think this is an issue I have no idea. The Union always laud their locker room. As for the contract, it’s quite Union friendly. If Fabian doesn’t work out this year or his back problems persist the can get out of it next year. If he plays well he stays. He’s also definitely better than “above average potential”. Rosenberry and Curtin couldn’t exist together? Huh? They seemed just fine last year. The trade was about getting value for a player due a significant raise at a position not worth spending that kind of money on for this team. Spending $400k-$500k on a right back in this cash strapped organization makes zero sense. As for Curtin and rotation, I completely agree here. For the third year in a row the Union have more depth than ever. Maybe this year Curtin will finally use.